Chuffed that not only is Hula the short film I co-wrote shooting RIGHT NOW in the Highlands of Scotland, but that we have the amazing actress Blythe Duff in the central role of Clara. Looks like they’ve got some decent weather too so fingers crossed for an excellent few days! If you’d like to keep up with Hula news and developments, follow us on Facebook here. 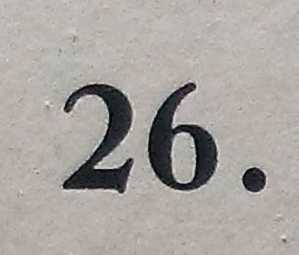 In the last few months, I’ve been working on creating my first ever Sestude – a creative written response that is just 62 words long for ’26’ a not-for-profit group who love words, and who are unafraid to bring together writers and creatives who use words in all manner of ways: copywriters and poets, screenwriters and novelists, journalists and technical writers. Museum of Childhood, 42 High Street, Royal Mile, Edinburgh, EH1 1TG from 9 October, 2015 @ 8:00 am – 17 March, 2016 @ 5:00 pm (exact dates to be confirmed). We’ll also be hosted at Edinburgh City of Literature’s Salon to chat about the project in November, and the exhibition’s online advent calendar goes live (for 26 days) on 1st December. Wow, I know, 2 posts in a month… living on the edge! But August is proving to be a very good writing month, with the news that my short play The Last Guest will be playing the Edinburgh Fringe as part of Village Pub Theatre’s extravaganza of writing. If you fancy seeing it, along with lots of other great writing, then it’s on the evening of 29th August – tickets here! They featured the first public reading of the play so it was great to be asked to reprise it for the Fringe. 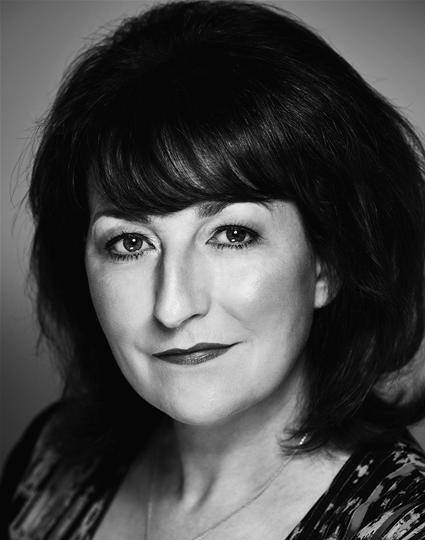 It has developed from a much more esoteric piece I wrote for the Traverse Theatre’s Noisy Words about a woman who finds…. well….. a rather unique final guest leftover from her Halloween party (to tell you more would spoil it!). Nice piece here by The Scotsman. And the VPT Facebook page is here if you want to stay updated. Now I’ve given it a little edit and refresh, I desperately want to make it long-form and into a musical. I know. That’s nuts. But I might do it anyway. Hello, been a while, but I’ve been busy! In my day life I’ve been writing about cocktails and all things cidery for Thistly Cross Cider. 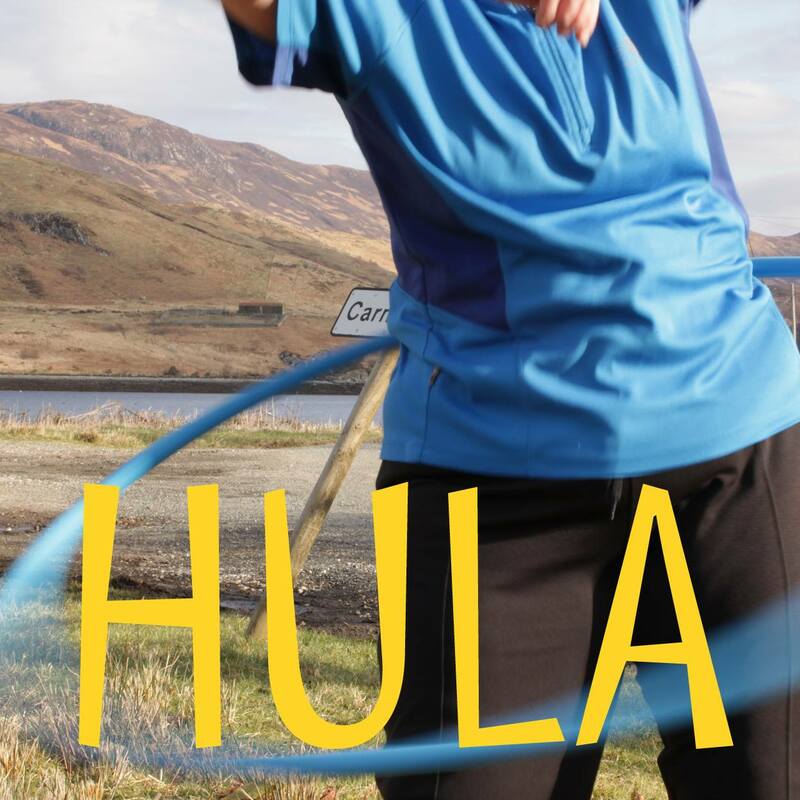 In my freelance life, one of the things I’ve been working on for the last 8 months is a Scottish-based co-written short film called Hula. Set in the Highlands of Scotland, it’s a story about liberation. Plot Outline: When her daughter leaves for the bright city lights, a lonely, cash-strapped divorcée must open her home as bed and breakfast. But each guest that arrives disturbs her status quo – can she accept this change and embrace mid-life liberation in her small rural community? I’ve been developing, writing, rewriting and honing (we love the word ‘honing’) alongside writer Claire Nicol and director/writer Robin Haig, and now I’m thrilled to say we have script lock! Due to film in the early Autumn, there will soon be more exciting news, but for now if you’d like to follow our progress, please ‘like’ our official Facebook page here. Thrilled to hear Love Cake is screening at the Sardinia Film Festival as part of a selection chosen by Edinburgh Short Film Festival. 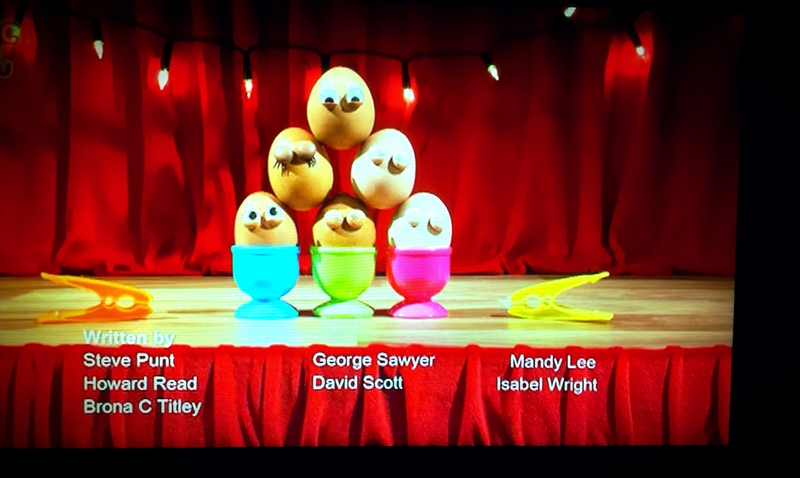 I worked that pause button hard on CBBC, but it had to be done… here’s the OOglies credits from the start of Series 3 featuring my name. Always nice to see a new credit when work has been completed. Especially when said project reaches the viewing stage! Excited to see a TV series I worked on in the latter half of 2014 is now about to be aired! 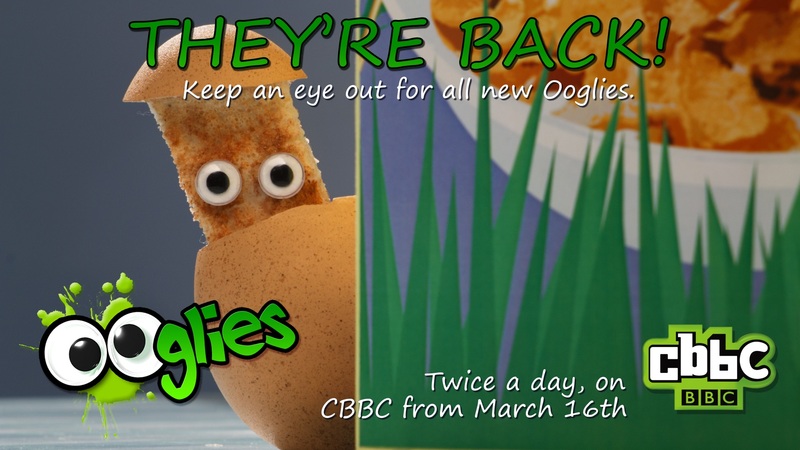 Series 3 of OOglies, a stop-motion animated children’s series, will start broadcasting this afternoon, Mon 16th March on CBBC, twice a day at 15.15 and 18.20. I was lucky enough to be on the writing team alongside some amazing creatives, working on OOglies’ short, comedy sketches featuring animated food and household objects, most of which feature the infamous ‘googly’ eyes. *Fact: previous episodes watched with my niece and nephew inspired a new personal tradition – I still stick OOglie-style wobbly eyes on my Christmas satsumas every year! 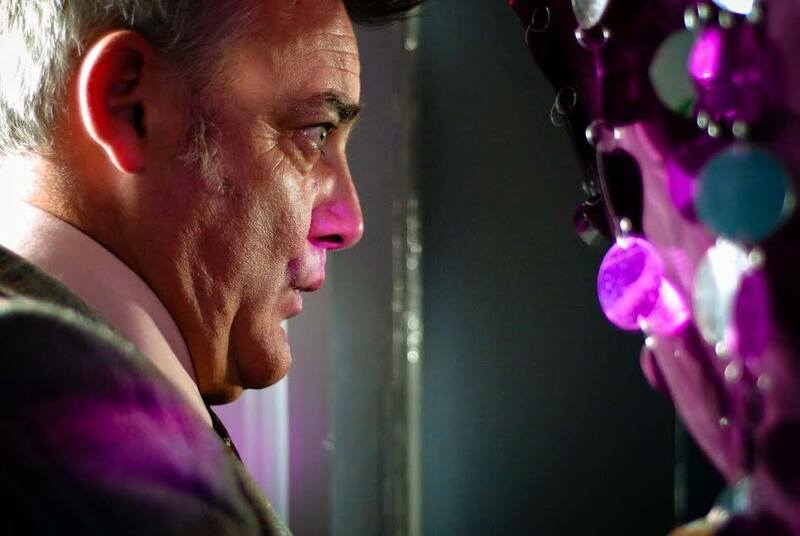 It was a fantastic experience to be involved with such a beloved, BAFTA-nominated programme, and I’m looking forward to seeing both old and new characters and their splat-tastic adventures making it to air. TV listing (and that all-important credit) here, and here’s even more OOglies info including one of their Comic Relief sketches.